Welcome To SURYA YOGA CAMP 2019 information & booking web site. Now in its eleventh year, Surya Yoga Camp is about getting away, trying new forms of yoga and movement and finding harmony, within yourself and with those around you. It’s a small festival which takes place once a year and welcomes families and single visitors alike. In 2019 the festival will be held over the late May bank holiday from 24th – 28th May at Chyan Cultural Centre, Nr Falmouth, Cornwall. Arrivals from 4pm on Friday 24th, workshops Saturday to Tuesday inclusive and departures by 4:30pm on Tuesday. 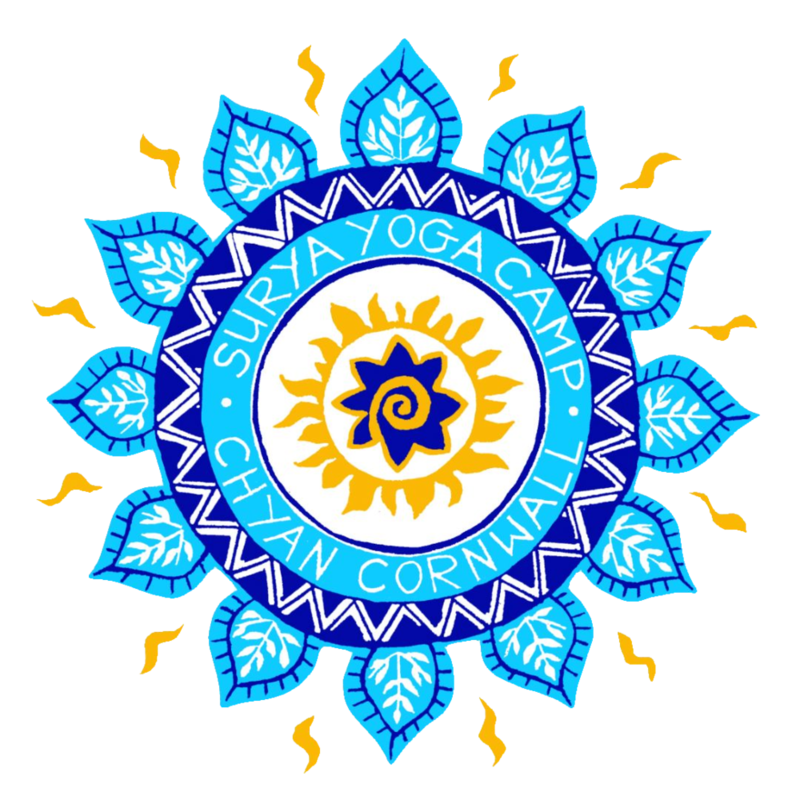 Surya is a great place to expand your yoga horizons; whether you are a lifelong yogi or a newcomer; from early meditation practice to kirtan evenings – diversity, openness and exploration are able to flourish in our non-judgemental space. All of our teachers are here because they love what they do. They have been specially selected for their enthusiasm, their skill and their dedication to yoga or chosen discipline. They are all qualified and experienced. Not only that, but they all come and work on an exchange basis, which is what helps to keep the cost of the festival low. Without their generosity of spirit, Surya would be an entirely different event and I thank them for being prepared to offer their services and for bringing their energy to hold the space. Visit facebook and ‘like’ surya yoga camp to find out more. (Click on the facebook icon below the menu bar on this page). SURYA is particularly geared towards being safe and enjoyable for families. The whole site is Drug and Alcohol free and we are sorry that we do not allow dogs. We also have a ‘Peace and quiet time’ for everyone from 10pm onwards. This means that those with young children are able to get well deserved rest. For night owls there will be spaces you can use for quiet company. If you do not like any of these policies then please choose nearly any other festival where you can drink, smoke, drum etc. On arrival you will be asked to sign a site agreement which relates to the above. Sign up to receive occasional updates about Surya, Yoga and Chyan events, including when the early bird Surya tickets go on sale. Surya Yoga Camp will use the information you provide on this form to be in touch with you and to provide updates and marketing via email. You can change your mind at any time by clicking the unsubscribe link in the footer of any email you receive from us, or by contacting us at suryayogacamp@gmail.com. We will treat your information with respect. By clicking Sign Up, you agree that we may process your information in accordance with these terms.